(Macao, Dec. 18, 2018) – PUBG Corporation’s hotly-anticipated PUBG ASIA INVITATIONAL MACAO 2019 event will take place at The Venetian® Macao’s Cotai Arena on Jan. 10-12, 2019. Tickets go on sale on Dec. 19, 2018 at all Cotai Ticketing box offices. Sixteen leading clubs from five major divisions across Asia will battle it out for a prize pool of US$500,000 and to become title of champions of Asia at PUBG ASIA INVITATIONAL MACAO 2019. It is the second Asian PUBG event following on from the G-star ASIAN INVITATIONAL that was held in Busan, Korea, back in 2017. PUBG GLOBAL INVITATIONAL 2018 which took place in Berlin was also a major success. A thrilling spectator sport, this year’s event gives the best Asian PUBG players the opportunity to demonstrate their ability and team spirit, while providing a compelling audio-visual feast for PUBG fans around the globe. PUBG ASIA INVITATIONAL MACAO 2019 is organised by world-leading eSports tournament operator and production company Versus Programming Network (VSPN). VSPN is the sole operator for both PUBG CHINA PRO INVITATIONAL season 1 and 2 as well as a number of other premier game leagues. Don’t miss the exciting PUBG ASIA INVITATIONAL MACAO 2019 at The Venetian Macao’s Cotai Arena on Jan. 10-12, 2019! ICBC Sands Lifestyle Mastercard cardholders can enjoy 20% discount on ticket prices as well as earn points when shopping or travelling anywhere in the world and then redeem them in Macao within Sands Resorts Macao’s integrated resorts. 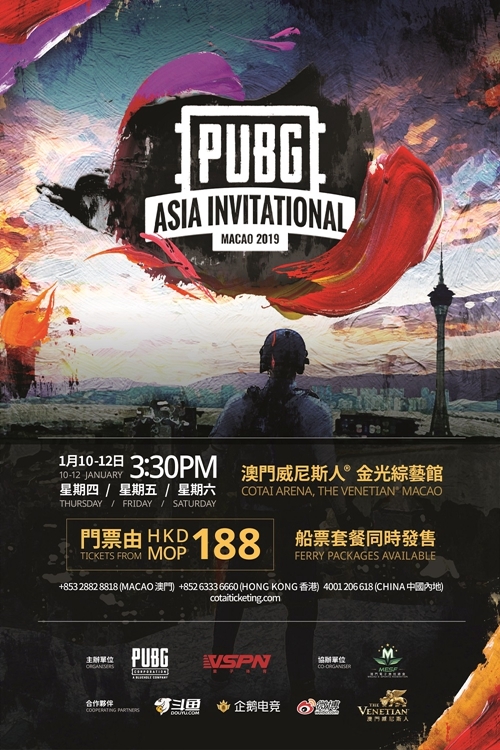 Date and Time Jan. 10-12, 2019 (Thur/Fri/Sat), 3:30 p.m.
Photo Caption: PUBG ASIA INVITATIONAL MACAO 2019 event will take place at the Cotai Arena on Jan. 10-12, 2019, with US$500,000 up for grabs in prize money.